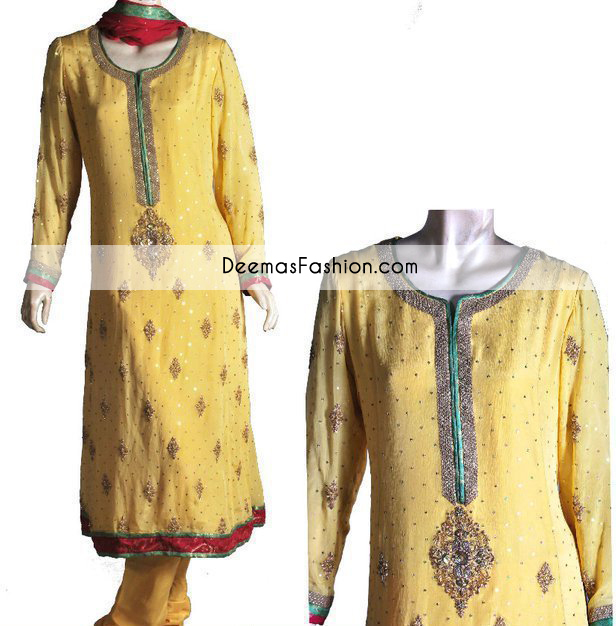 Tags: A-line, Bottle Green, Churidar Pajama, Full Sleeves, Mehndi Mayon Henna, Original Design, Red, Yellow. Top: Yellow pure banarsi crinkle chiffon A-line shirt having embroidered neckline. Under the neckline beautiful ornamental motif implemented. Small ornamental motifs scattered all over the shirt. double banarsi fabric implemented on hemline as border. Fully lined dress. Concealed with back zip closer. Trouser: Yellow pure grip churidar pajama. Dupatta:Red pure crinkle chiffon dupatta finished with piping on edges. Embellishment includes stones, pearls, dabka, kora, sequins, tilla, beads and thread work.